EDGE | Pro Chem, Inc. 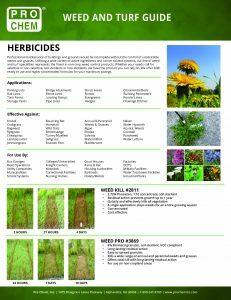 EDGE is a unique combination of weed killing ingredients that eliminates the backbreaking job of handpicking weeds and grasses without injury to desirable woody barked plants, even if sprayed on stems, trunks or roots. It is a contact killer that kills by absorption only through the leaves. 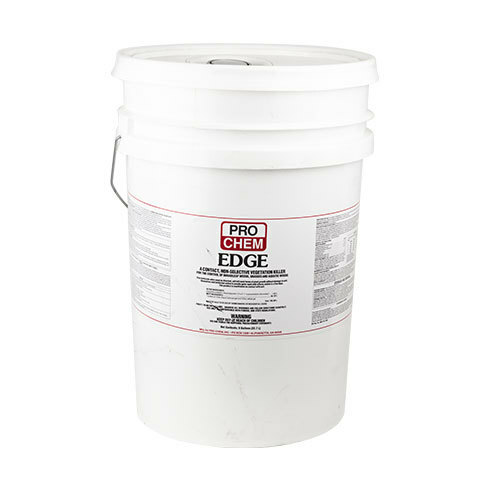 EDGE can be used to remove unwanted weeds and grasses that grow in ornamental beds, among evergreens, hedges, shrubs and around trees, fences and buildings. Visible kill is seen within a few days. The product becomes inactive on contact with the soil and, therefore, is non-toxic to desirable plants through root absorption. It does not sterilize the soil. EDGE can also be used as a lawn trimmer and in aquatic applications. In aquatic applications such as ponds, lakes or drainage ditches, it will control both weeds and algae. Please refer to label and dilution chart for specific applications. NON-CROP OR NON-PLANTED AREAS: To kill above ground weed growth around buildings and other installations, walkways, patios, fence line, parkways and driveways for control of undesirable broadleaved and grass-type weeds – 2 ½ gallons per 20 gallons of water (16 oz. per gallon of water). Apply for full coverage and thorough weed contact. Apply preferably to young growth and up to seeding of weeds. Repeat applications as necessary to maintain control, particularly on grasses and established weeds. Avoid spray contact with foliage, food crops or ornamental plants. Do not water treated areas for 24 to 36 hours after application. Do not ally entry of maintenance personnel into treated areas within 24 hours after treatment unless protective clothing is worn. For four days following application to non-crop areas (other than aquatic or residential sites), do not allow employees to have contact with the treated plants, except for contact with their footwear. For residential sites, do not allow people or pets to touch treated plants until the spray has dried. For aquatic sites, do not allow swimming in treated areas within 14 days of treatment. Make application from a boat or other suitable craft either by injecting chemical below the water surface (or) by pouring it directly from the container into the water while slowly moving over the water surface. Maximum Rate 4 lb. cation/surface acre-foot. *Repeat application may be necessary under conditions of heavy infestations or where reinfestation may readily occur from seed, fragmentation or escape. FOLIAGE SPRAY DIRECTIONS: Foliage spray treatments should be applied in sufficient water (150-200 GL per acre) to thoroughly wet foliage. As the season progresses and vegetation increases in mass, the higher dosage indicated should be used and more uniform distribution is necessary. Local conditions may affect the use of this chemical. Consult agricultural experiment station or extension service weed specialist for specific recommendation for dosage, time of application and control of other weeds. Do not apply at rates higher than specified here or on the label.